10 Habits Of People With A Healthy Relationship To Food - Welcome to SarahKesseli.com! How do you know if you have a healthy relationship with food? Since beginning my coaching journey I have learned quite a few tips, tricks, and habits from healthy eaters. 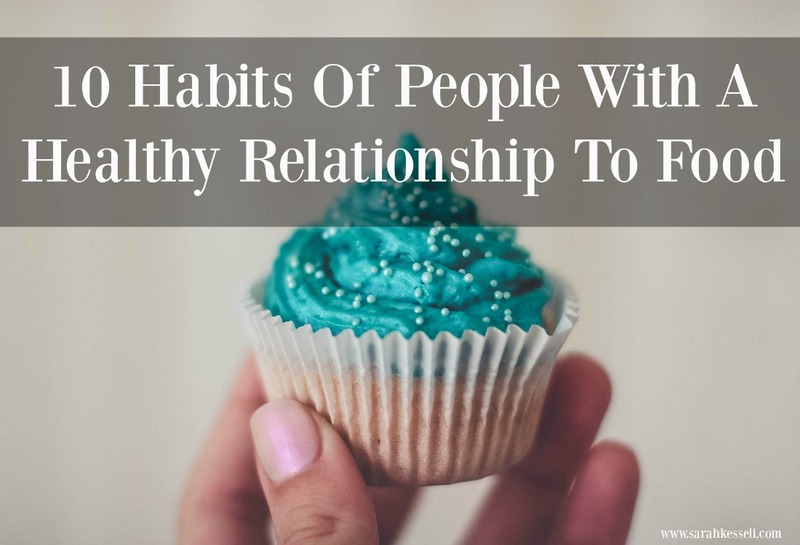 Here are 10 habits of people with a healthy relationship to food that I always talk about in my coaching. See how your mindset about food compares to this list. If more than two of these items stand out to you as things that you cannot image ever thinking or doing, then it may be time to see if there is an underlying issue such as emotional eating, binge eating or disordered eating. 1. They eat when they are physically hungry. They start their day with a balanced meal or protein, carbohydrates, and fats to keep their energy levels up and keep cravings at bay. Skipping breakfast in the morning to ‘save calories’ will only lead to cravings later in the day. 3. They believe in all things in moderation, including moderation. 4. They trust their bodies. They listen to their hunger and fullness by eating when they begin to feel hungry and stopping when they are satisfied or comfortably full. Their meals are not based on certain grams of protein, carbohydrates, and fats – eating whether they are hungry or stuffed just to hit macronutrient numbers. 5. They focus on both nourishment and enjoyment. Yes, it is important to eat foods that nourish your body, but it is also important to eat foods that you enjoy. If you are eating only for nourishment (i.e., only ‘clean’ or ‘healthy’ foods), it will lead to cravings and overeating later on. 6. They don’t ‘make up’ for a meal. There is a tendency to eat less or exercise more when we feel we have overindulged ourselves. We try to balance out the ‘damage’ we think we have done. Our bodies are very smart pieces of art. If you are truly listening to your hunger and fullness; eating when hungry and stopping when full, a little extra now and again will not damage your body. 7. They don’t set themselves up for failure. If you are aware of emotional eating patterns or foods that trigger you to overeat, you can make small changes by removing them from your house or buying them in small amounts. Please remember that this does not mean restricting them from your diet. A simple solution would be to enjoy them outside of the house 1-2x a week. 8. They do not eat in secret. If they are hungry or craving a particular food, they can freely and easily enjoy what they are craving in the company of others. If you find yourself eating late at night or only when alone it may be time to look at why. 9. Thoughts of food do not interfere with daily life. They do not miss out on social engagements due to food concerns. They also do not let thoughts of when and where their next meal will be take over and distract them from daily activities. 10. They know that balance isn’t about perfection. Health and happiness are attained when a balance is found. Swinging a little more one way or other from time to time is ok.